Matt - MC becomes the owner of the first NISMO R35 GT-R delivered in the US. Great first owner. Matt was one of the founders of NAGTROC, the North American GT-R Owners Club. Check out the video and press release below. WINSTOM-SALEM, North Carolina – It was a momentous day for Winston-Salem, North Carolina, resident Matt McCulloh, and a historic day for Nissan. 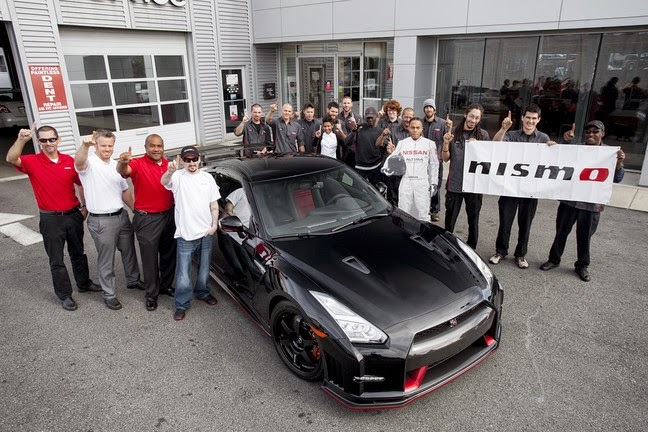 McCulloh took delivery of the first 2015 Nissan GT-R NISMO made for the U.S. market. "It is just exciting, because you see how happy he is. And whatever it is in life that makes you happy, you just well up in tears thinking that he has worked so hard for this day. And, although it is just a car, to him it is something he has been very passionate about. And it is just a great day – just a fun day," said Sherry McCulloh, Matt's mom. This legendary car made its debut in 2013 concurrently with introductions at the Tokyo and Los Angeles auto shows. With 600-horsepower*, it is the most powerful Nissan GT-R ever. This 2015 model year version is sold out in the U.S. market. "It was like a surreal moment for me. I saw it, and it just took a second to register that this was finally my car. And that I was going to have the privilege to own the very first GT-R NISMO for the United States and be a part of the great 30-year history of the NISMO brand," said Matt McCulloh, GT-R NISMO owner. McCulloh knows this history well. He co-founded NAGTROC, the North American GT-R Owners Club in 2006, and he enjoys connections to many in this enthusiast community. "The GT-R NISMO has more than fulfilled my wildest expectations. Just looking at this car – it to me is the quintessential version of the GT-R that I have always longed for," said McCulloh. "It is an honor to have been along with the ride the entire way from having an '09, a '12. Having that history with the GT-R is going to allow me to have a deeper appreciation of this car. I can see where it started to where it is now." Nissan realized this historic first car had a unique owner. The company made certain to show their appreciation for McCulloh on delivery day. "When we realized his passion for the car, his involvement with the GT-R community, and his involvement with the brand, we wanted to do something a little extra special. First we wanted to be here, to shake his hand, see the smile on his face and just take pride in that moment with him," said Jeff Simmons, Nissan Marketing. "Additionally we have a little something special for him. We have a crew at his house and they are giving his garage a makeover. That is going to be the home of his new NISMO, so we are giving it a little NISMO touch." The Nissan GT-R is assembled at Nissan's Tochigi plant, located about 60 miles north of Tokyo; its potent engine is carefully hand-assembled by a single craftsman at NISMO's Yokohama engine factory. A limited number of GT-R NISMOs are made each year. The amount of those that reach U.S. shores is even more limited. This car, the first delivered in the U.S. and the one that McCulloh has been waiting for, now is at home in North Carolina. He says his new baby will see some time on the road ... and plenty of time on the track. "This car to me is like a brute-force tool. To me it is so purpose-built that I am going to do a lot of track," said McCulloh. "I'm going to really use this car as far as track, autocross, a little drag-strip – so, you know, track and getting to spend some time in this great garage that I have here now."